If you make a radio show or podcast, there are a lot of good reasons to try recording an episode in front of a live audience: It’s fun, it cements bonds between you and your fan community, it wins you new fans (tell everyone to bring a friend!) and it can even generate revenue. If you’re still hesitant because you’re scared by the logistical challenges involved, here is my technical setup for performing and recording live episodes of The Pub. I do it with about $1,000 worth of equipment, almost all of which I already had in my radio reporter’s toolkit, and all of which fits in my backpack. The centerpiece of my setup is the Zoom H6 ($400), which I think is clearly the best consumer-grade audio field recorder on the market right now. It serves as both my recorder and my mixing board for the house sound. The H6 is a six-track recorder — four XLR/TRS inputs plus L and R channels fed by a detachable stereo on-board mic module. For another $70, you can get an expansion module that gives you two additional XLR/TRS inputs in place of the on-board mic. The only drawback is that the inputs on the expansion module cannot feed phantom power, which is necessary for condenser mics that don’t have their own power source. I run my host mic and up to three guest mics into channels 1–4, using really long XLR cables ($25 each) so that my guests and I have freedom of movement on stage. If I only have one or two guests, I keep one of my mics pointed at the audience to capture their reactions. My go-to, all-purpose handheld mic is the Shure SM86 ($179), which is a condenser mic with no battery compartment, so I need the phantom power available from those four main inputs. For playing music, actualities and other recorded sound live, I use the iPhone app CueZy (free with $7 of in-app purchases to make it fully functional). This is the best sample pad app available for doing this kind of work — and I’ve blown too much money trying other ones. You upload your sound files from your computer to Google Drive or Dropbox and download them into the app on your phone. You can preload up to 729 sounds, adjust their playback levels, fade them in and out, etc. It’s the best $7 I’ve ever spent. If all the sound you’re planning to play is mono, you could just leave one of the 1/4″ plugs on the stereo breakout cable hanging, thereby freeing up another input on the expansion module. However, DO NOT connect your iPhone or computer to the Zoom using a TRS cable, like the kind you might use to connect your phone to your car stereo. Bad things happen when you send a stereo cable into a mono input jack — phase cancellation between the stereo channels will eliminate all sounds that are balanced across the stereo field, the way a karaoke machine eliminates lead vocals from songs. Either use the stereo breakout cable and leave one end hanging, or buy a TS (mono) cable. Once you’ve got all of your sound sources plugged into the Zoom, it’s time to send the output to the house sound system. My method here depends on there being some kind of PA system at the venue where I’m doing my show, and there usually is. I do most of my shows on the road, and I can’t be hauling loudspeakers on the plane with me. But if you want to be totally self-sufficient, buy one or two Mackie loudspeakers (I like the SRM450v3, $400) plus stands. 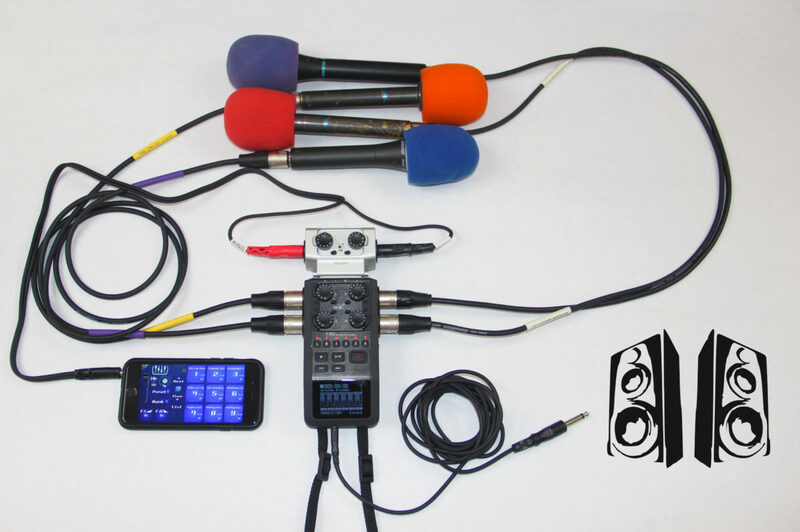 You need a cable to connect the “line out” on your Zoom to the PA. What you use depends on whether you care about your in-house audience hearing stereo or mono sound. I like to keep things simple, so I use a 3.5 mm to 1/4″ TS (mono) cable ($5). Most PAs either have a 1/4″ input or an XLR input. I keep a 1/4″ to XLR adapter ($9) handy in case the PA only takes XLR. If you want your in-house audience to hear things in stereo, then you’ll need another stereo breakout cable (and one more XLR adapter, to be safe). The cable will need to be really long if you’re going to be sending one channel to a speaker on the left side of the stage and one on the right side. However, your venue may just have a mixing board or a routing box where you can plug in both channels. The audio levels that are best for your live audience are often different from the levels that are best for your radio/podcast audience. The beauty of the Zoom H6 is that it records all inputs to separate tracks; you can mix them to your heart’s content in postproduction. So, when I’m doing my live shows, I adjust the levels (via the Zoom’s handy dial controls) to accommodate the acoustic needs of the space I’m in. As long as none of my signals clip, I can adjust the mix as necessary in post. If you have one mic that needs to be so loud for the live audience that you risk clipping, you can individually adjust the monitor levels (and stereo balance) of each input channel in the H6 — that is, adjust the levels that you hear out of the headphone and line out jacks, as opposed to the levels that the Zoom records. The monitor mixer is in the “INPUT & OUTPUT” menu in the H6. Be careful about boosting your levels too high when you’re recording live in the venue, because you might get feedback. The best way to avoid feedback, apart from keeping your levels in check, is to make sure that you and your mics are well behind the speakers. Once I get to the postproduction mixing stage, the biggest change I make from my live mix is reducing the levels of mics when no one is speaking into them. If all mics are up full the entire show, the sound tends to have too much room ambiance and reverberation for my taste. I tend to keep all mics ducked low in the mix (not all the way down) unless and until somebody is talking on that channel. However, I often bring up the level on my extra mics when there’s an audience reaction that I want to be audible, like laughter. Here’s an example where you can hear a 15-sec clip from my last live show mixed three ways: with all mics up full the whole time; with only my mic up full the whole time; and with the extra mics ducked down and then pulled up full for the laughter. The third version is from the actual podcast mix that I published. One more thing about mixing: If you’ve recorded your music/actualities to two separate mono tracks on the Zoom, don’t forget to pan one of those channels hard left and the other one hard right when you get them into your editing software! Otherwise it’ll just sound mono. Maybe your show doesn’t have any scripted elements, but mine does. I usually like to read from a printout of my script — it’s more stable (paper doesn’t crash! ), more flexible (I can carry it around the stage without unplugging it! ), and it doesn’t project a weird glow onto my glasses in the dim venue lighting. If you decide to go with a paper script, take a second to think about how you’ll hold it. I like to have at least one hand free for gesticulation, so I don’t want to have to hold a mic in one hand and a script in the other. That means I either need a stand for my mic or a stand for my script, and I opt for the latter. I travel with a collapsible wire music stand ($10), which is smaller and lighter than any mic stand. When I’m doing a show with visuals, I have to have my computer out to advance through my slides, so I write my script into the “presenter notes” box in Keynote and read off the screen. And that’s it! That’s how I travel the country doing live shows entirely by myself with gear I can fit in my backpack, most of which I already owned. All I need is a PA and a crowd. Addendum: A reader points out to me that that the X/Y mic capsule that comes standard with the Zoom H6 has a 3.5 mm stereo input on it. To run stereo sound from a phone or computer into the Zoom, you could just run a standard 3.5 mm TRS patch cable from the headphone output to that little aux input on the X/Y capsule. That would save you from having to buy the expansion module. This is a good point, and the only reason it didn’t occur to me is because I broke and then threw away my X/Y capsule, so I forgot that it had an aux input. However, I’ll point out that the expansion module is a good thing to have nonetheless, because you can also use it for additional mic inputs. The crisp, bright tone comes from a particular microphone — and a few other elements.